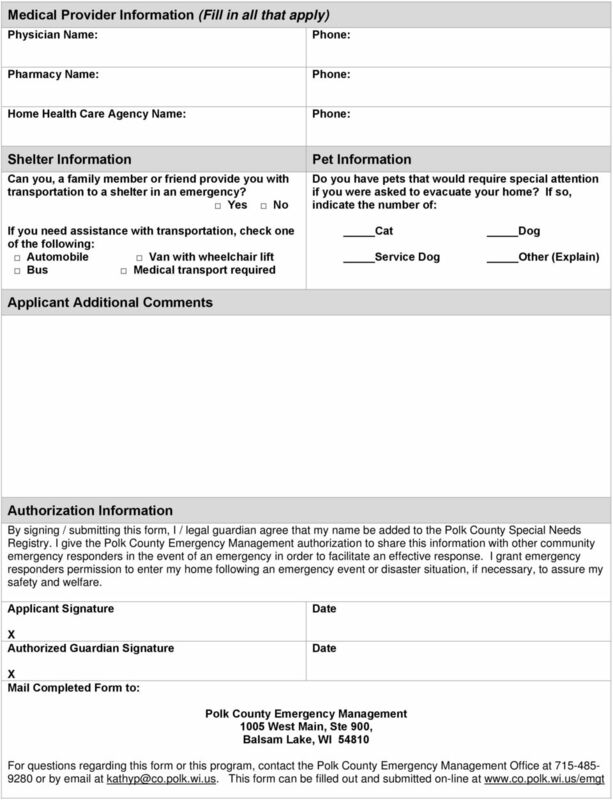 Download "Polk County Special Needs Registry"
1 Polk County Special Needs Registry The Polk County Special Needs Registry is a program developed and sponsored by the Polk County Departments of Public Health, Emergency Management, Aging, Veterans Affair and Human Services. 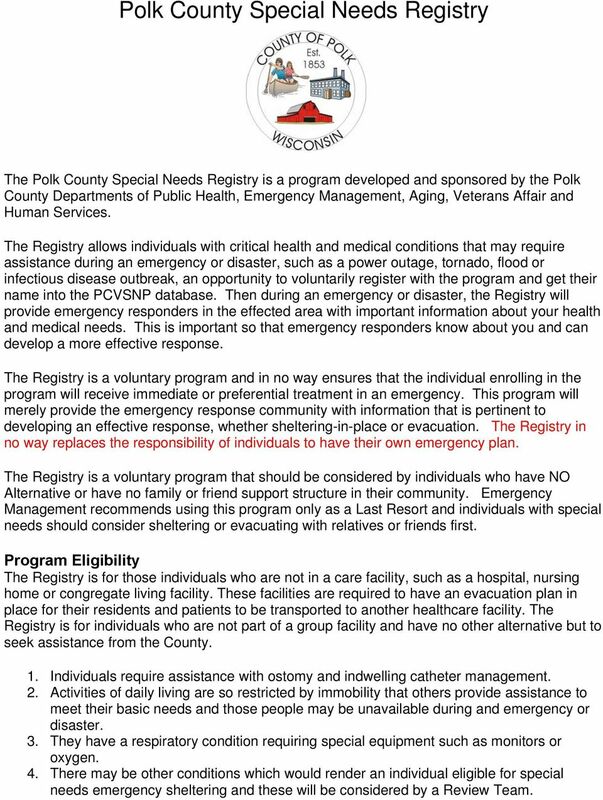 The Registry allows individuals with critical health and medical conditions that may require assistance during an emergency or disaster, such as a power outage, tornado, flood or infectious disease outbreak, an opportunity to voluntarily register with the program and get their name into the PCVSNP database. Then during an emergency or disaster, the Registry will provide emergency responders in the effected area with important information about your health and medical needs. This is important so that emergency responders know about you and can develop a more effective response. The Registry is a voluntary program and in no way ensures that the individual enrolling in the program will receive immediate or preferential treatment in an emergency. This program will merely provide the emergency response community with information that is pertinent to developing an effective response, whether sheltering-in-place or evacuation. The Registry in no way replaces the responsibility of individuals to have their own emergency plan. The Registry is a voluntary program that should be considered by individuals who have NO Alternative or have no family or friend support structure in their community. Emergency Management recommends using this program only as a Last Resort and individuals with special needs should consider sheltering or evacuating with relatives or friends first. Program Eligibility The Registry is for those individuals who are not in a care facility, such as a hospital, nursing home or congregate living facility. These facilities are required to have an evacuation plan in place for their residents and patients to be transported to another healthcare facility. The Registry is for individuals who are not part of a group facility and have no other alternative but to seek assistance from the County. 1. Individuals require assistance with ostomy and indwelling catheter management. 2. Activities of daily living are so restricted by immobility that others provide assistance to meet their basic needs and those people may be unavailable during and emergency or disaster. 3. They have a respiratory condition requiring special equipment such as monitors or oxygen. 4. There may be other conditions which would render an individual eligible for special needs emergency sheltering and these will be considered by a Review Team. 2 Frequently Asked Questions 1. What is the process for determining whether someone meets the program eligibility? Once an individual submits their application, they are automatically placed in Special Needs Registry database. A Review Team consisting of emergency response and health and medical partners will meet regularly to review the applications and make a determination. 2. How do I register? 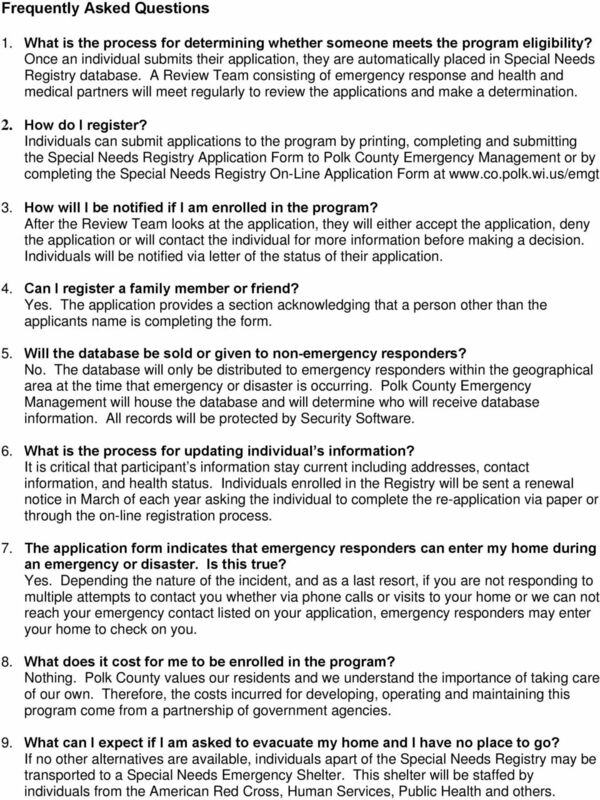 Individuals can submit applications to the program by printing, completing and submitting the Special Needs Registry Application Form to Polk County Emergency Management or by completing the Special Needs Registry On-Line Application Form at 3. How will I be notified if I am enrolled in the program? After the Review Team looks at the application, they will either accept the application, deny the application or will contact the individual for more information before making a decision. Individuals will be notified via letter of the status of their application. 4. Can I register a family member or friend? Yes. The application provides a section acknowledging that a person other than the applicants name is completing the form. 5. Will the database be sold or given to non-emergency responders? No. The database will only be distributed to emergency responders within the geographical area at the time that emergency or disaster is occurring. Polk County Emergency Management will house the database and will determine who will receive database information. All records will be protected by Security Software. 6. What is the process for updating individual s information? It is critical that participant s information stay current including addresses, contact information, and health status. Individuals enrolled in the Registry will be sent a renewal notice in March of each year asking the individual to complete the re-application via paper or through the on-line registration process. 7. 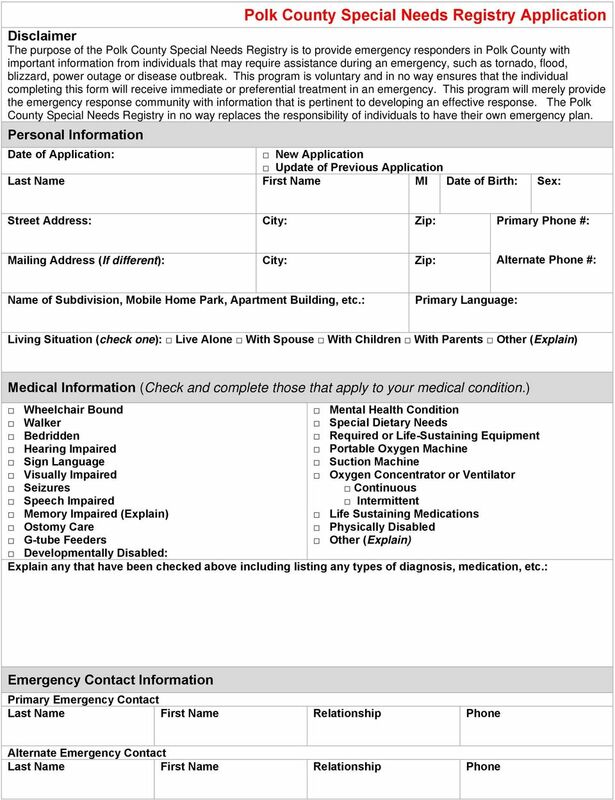 The application form indicates that emergency responders can enter my home during an emergency or disaster. Is this true? Yes. Depending the nature of the incident, and as a last resort, if you are not responding to multiple attempts to contact you whether via phone calls or visits to your home or we can not reach your emergency contact listed on your application, emergency responders may enter your home to check on you. 8. What does it cost for me to be enrolled in the program? Nothing. Polk County values our residents and we understand the importance of taking care of our own. Therefore, the costs incurred for developing, operating and maintaining this program come from a partnership of government agencies. 9. What can I expect if I am asked to evacuate my home and I have no place to go? If no other alternatives are available, individuals apart of the Special Needs Registry may be transported to a Special Needs Emergency Shelter. This shelter will be staffed by individuals from the American Red Cross, Human Services, Public Health and others. If you do not meet at least one of the two criteria above, then you do not qualify for services through the TXDDS program. REGISTRATION FORM. How would you like to receive health information? Electronic Paper In Person. Daytime Phone Preferred. WORKERS COMPENSATION EMPLOYEE S NOTICE OF INJURY (COMPLETE ALL ITEMS) EMPLOYEE S NAME: (last) (first) EMPLOYEE S ADDRESS: (no.) (street) (city) (state) (zip) TELEPHONE: Home: Work: SOCIAL SECURITY NO. WISCONSIN COALITION FOR ADVOCACY Driver s Licenses and Parking Privileges for People with Disabilities Tom Hlavacek, Milwaukee Office Director Wisconsin Coalition for Advocacy Chapter 343, Wis. Stats. Upon completion of your application, please mail it to our office at 317 Main St., Worcester, MA We will not accept faxed copies.